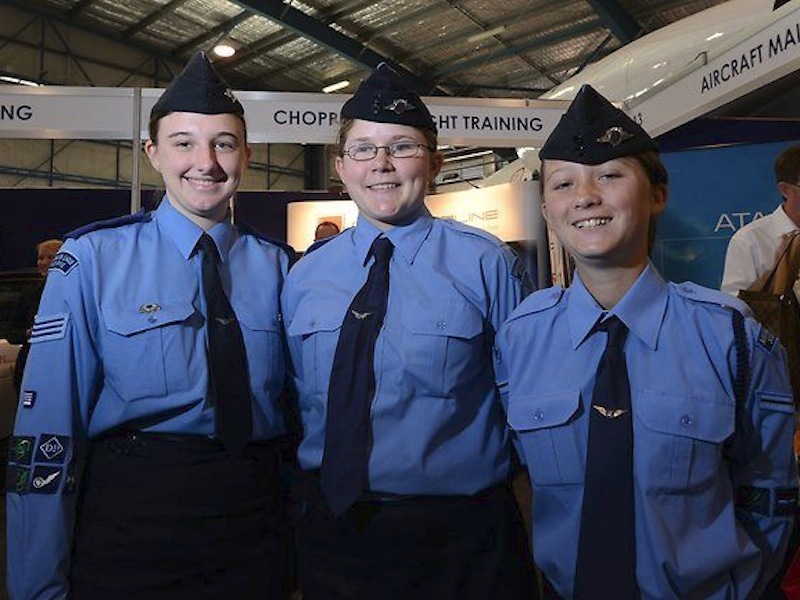 The Australian Air League was marvellously represented by a large uniformed contingent comprised of thirty Cadets and ten Officers across four Squadrons of the Queensland Group at the recent Aviation Careers Expo on Saturday 25 August, a peak industry event dedicated to fostering training & career entry into the aviation & aerospace industries. The participation of the Air League at the Expo, held within the Brisbane International Airport precinct, was generously sponsored and promoted by Aviation Australia, the event organiser and an industry leader in the training of aircraft maintenance engineers and flight attendants. Cadets and Officers of the Strathpine, Gold Coast, Forest Lake & Southport Squadrons operated a comprehensive Air League display promoting League programs and activities, ran a tie-in Air League & Aviation Quick Quiz, assisted with Careflight fundraising and conducted Drill displays throughout the day. Highlighted by regular PA announcements, and supervised by Squadron Captain Matt Hasking, Cadets performed a spectrum of Drill demonstrations, from Section Drill to Flag Party, hourly on the hour and centre stage for the many aviation focussed industry and public attendees at this well-populated aviation occasion. Air League members also made the most of the opportunity to explore the expo exhibits (including an outdoor aircraft display) and investigate their own career / aviation pathways with the many peak aviation employers and training providers present – an enviable blend of corporate, education, civil, military and government aviation organisations. Queensland Air League personnel left a strong positive impression with conduct and presentation remarked upon favourably by public, exhibitors and the organisers, and the community awareness profile and reputation of the Australian Air League boosted significantly in a core aviation sector.